If you’re a student-athlete looking to play at the next level, having a great SAT score can be very beneficial during the recruiting process. Coaches are looking for athletes that can succeed both on the field and in the classroom. Having better scores means you will likely have more opportunities available to you. We’ve scoured the web to give you a list of our top 7 SAT study tips to help you get the score you want. Before even starting to study for the test, you should know what your strengths and weaknesses are. This will allow you to better allocate your time when studying begins. The best way to do this is to buy an SAT prep book or look up free online practice tests, take the test without studying beforehand, and see what score you get. Use this score as a baseline to figure out what you will need to focus on. Take some time to research how the test is conducted and how many different sections there are. Remember that outside of the critical reading section, questions on the SAT are in ascending order of difficulty. You should be comfortable with finishing earlier questions quickly to save enough time to tackle harder questions. When you are taking practice tests, make sure to practice under time constraints of the actual test. Make sure to take at least 3-4 full practice tests. One of the biggest hurdles in standardized tests is managing your time, so learn how to answer questions and the essay efficiently. Some students may prefer self-test prep courses out of a textbook while others students may do better in a classroom setting or by taking an online prep course. Figure out what kind of setting you learn best in and explore the available test prep choices in your area. Seek out local test prep companies, borrow SAT prep books from your school library, or talk to your guidance counselor and see if your school provides any free courses to help you prepare for the SAT. You will want to start this process months before the actual test so make sure you study in the way you feel most comfortable. The 25-minute time slot provided for the essay section of the test is shorter than the amount of time students are typically used to writing essays. The best way to prepare for this section is to practice extensively using sample prompts from previous tests or through your specific SAT prep course. Essay prompts tend to be very broad with topics such as honesty, mistakes you’ve made, success, and other open-ended questions. With enough practice, you should be able to read the prompt, quickly draw up a rough draft, and form a coherent thesis in the course of a few minutes. A big part of the essay is being able to provide evidence, which typically comes from history, literature, or your personal history. You will want to close your essay with a short summary of your main thesis as well. To score well on this section you will want to practice increasing your response speed while still providing enough depth and clarity in your response. 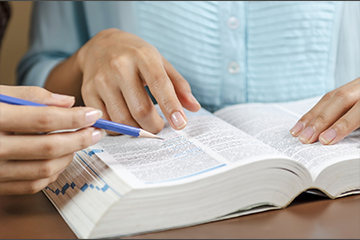 A large aspect of the SAT is the vocabulary section and critical reading section. A great way to study for both of these sections is to pick up a couple of novels. In the year before taking the test, spend time reading various novels both for leisure and your classes. During your reading, make sure to identify any words you are unfamiliar with and look them up later. Students with an inclination for reading have proven to be much more likely to succeed in the vocabulary section of the test. Also, when you are reading try to occasionally summarize the author’s argument in your mind, which will really help improve your comprehension ability. Just add these two steps to your reading routine and you’ll be killing two birds with one stone! Although the SAT math section is generally known to be slightly easier than the ACT it can also be pretty tricky. All the formulae needed are provided in your test book at the beginning of the section so your main task is to figure out what is being asked and what information is actually relevant. Reading carefully is important in this section, as the SAT math questions are typically aimed to trick you into selecting the most obvious answer. Remember to underline keywords and spend some time referencing the question with information you know from studying. Problems are not incredibly time intensive compared to typical math problems you’re used to but it is very important to spend adequate time understanding what is being asked before rushing to complete your calculations. Don't Stress out and Get Moving! Spending enough time to study is important but you should also be taking time to relax and get fresh air. Spending an hour outside where you can go on a calm walk or a brisk jog can help you relax your mind and provide you some needed time outside your study zone. This is a great way to help ease anxiety as you get closer to your test day. Spend your last week before your test reviewing what you’ve learned the past few months but make sure to take occasional breaks to get your body moving. What you don’t want to do is to hole up in your room the entire week before your test cramming on a nightly basis. The SAT’s require a lot of stamina and coming that morning physically drained will make it harder on yourself to get through the afternoon. With months of preparation under your belt, coming to your test well rested and relaxed is the best way for you to tackle this test.